Peter Gatuna is a native of the Samburu District. He wishes to cooperate with Terry Manning to promote integrated self-financing development concepts in the Waso area of the Samburu district in Kenya. Mr Gatuna is supported by the Samburu County Council and in particular the three councillors for the Waso project area, by the Member of Parliament for Samburu, and by the national government through the Ministries for Poverty Alleviation, Rural Water Suppply, Rural deveopment, Health, and Education, who collectively wish to co-finance and promote the project. 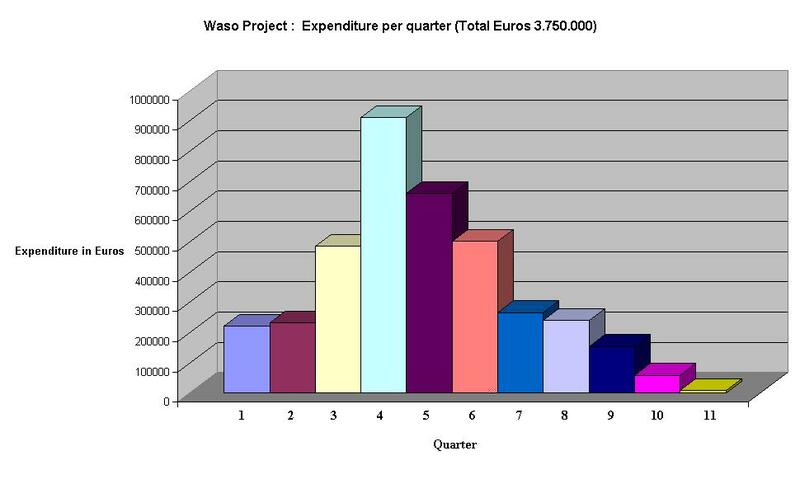 The project is founded on the idea that most people in the Waso project area are able and willing to pay for their own hygiene education, water supply, sanitation, rubbish disposal and bio-mass production structures provided they have the seed money necessary to get started. The seed money will be interest-free. The project "New Horizons for Waso" will be financed using a 10 year interest-free development loan for Euro 4.500.000, local currency or LETS (Local Exchange Trading) systems and a cooperative interest-free Micro-credit system modelled on the successful Grameen banks in Bangladesh. There is ample potential to develop the production of goods and services at community level in the project area where development is presently restricted by a chronic lack of formal money. Leakage of financial resources away from the project area makes the problem worse because it artificially limits the people's basic right to produce and exchange goods and services. A local cooperative bank (the Waso Cooperative Development Bank) dedicated to development in the project area will be set up to support the project by pioneering the introduction of interest-free cooperative micro-credits for productivity development in the Waso Division area. Mass capacitation techniques, as introduced by the Brazilian Clodomir Santos de Morais, through which the users themselves organise, execute, run, maintain, pay for and own the structures set up under the project are used to set up the main project structures. The "Gypsum composites " technology developed by the Dutch technology developer Eos Consult enables many items important to local development projects to be made in low cost labour-intensive local production units with 100% local value added without the need for any formal money at all. Hygiene training programmes based on the formation of Community Health Clubs have been successfully developed and introduced by the NGO Zimbabwe A.H.E.A.D. Hygiene education will also be made available to schools. Real savings on present fuel costs for cooking and a possibility of qualifying for carbon emission reduction certificates for sale go a long way towards financing the project. This proposal is essentially self-financing, subject to certain aspects involving interest payments, exchange rate variations and "insurance" set out in detail in the project document. Paran is a non governmental, non profit making community based organization based in the Samburu district of Kenya. 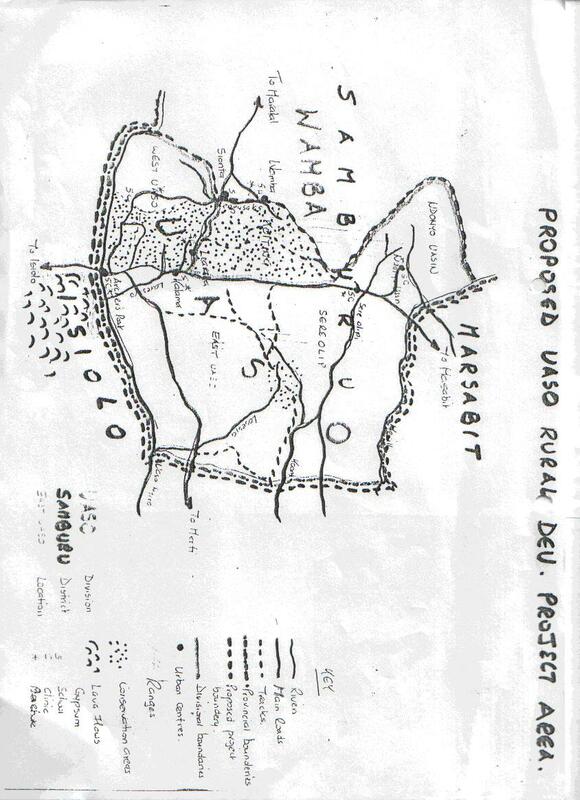 It was formed in August 1999 and registered with the Samburu District Council under register number SBU/DSS/CD/1/A568. (Certificate not supplied.) The overall goal of the NGO is to mobilize the community against poverty and to protect the environment. SCHEDULE 11 Constitution and Statutes of NGO Paran. Supplying such basic life needs warrants top priority within the framework of foreign aid programmes for the benefit of the poor in developing countries, including Kenya. Development of local production and services is hindered by a chronic lack of formal money. The little formal money there is leaks from the local economy to national, or more often, international, havens. The project will permanently improve the quality of life and stimulate on-going local economic development of the people in the project area. It will establish local exchange trading (LETS) systems for the exchange of local goods and services and provide interest-free seed money to fund micro-credit loans. It includes hygiene education, sanitation, clean drinking water, lighting for study, efficient cooking equipment and means of producing bio-mass to fuel the stoves as well as a system for recycling non-organic solid waste. Services may be extended in a later phase to rainwater harvesting and Solar Home Systems. A project radio station will be set up. The project will also encourage local contribution to improved primary and junior secondary education structures. The proposed hygiene training, sanitation, and drinking water systems take the social structures of the communities into account. All structures are self-financing and remain financially viable and sustainable without the need for further seed money once the initial interest free seed loan has been repaid. 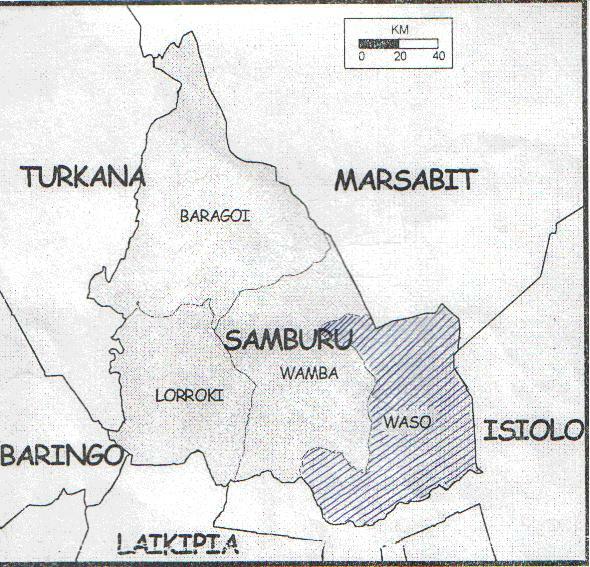 The Waso project area is one of the 6 sub-districts of Samburu in Kenya. It is bordered by the Wamba subdistrict of Samburu to the West, and the districts of Marsabit to the North and Isiolo to the East and South. The project area covers about 6000 km2 being 100km north-south and 60 km east west. The area is divided into 3 administrative divisions, being Waso West to the South West with an expected population of about 22.000, Waso East in the South East with an expected population of about 21.000, and Sere Olipi to the North with an expected population of 14.000. 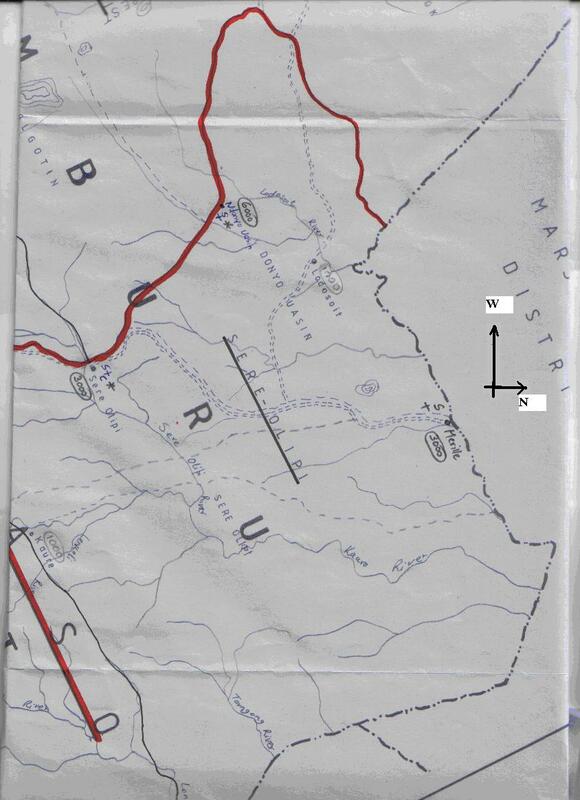 The geography of the area is irregular with several water catchments with a dominating west-east direction. Particular mention is made of the Sere Olipi river system in the North, the Sera-Lontopa rivers system in the centre, and the Losesia and Lanisolo systems in the South. 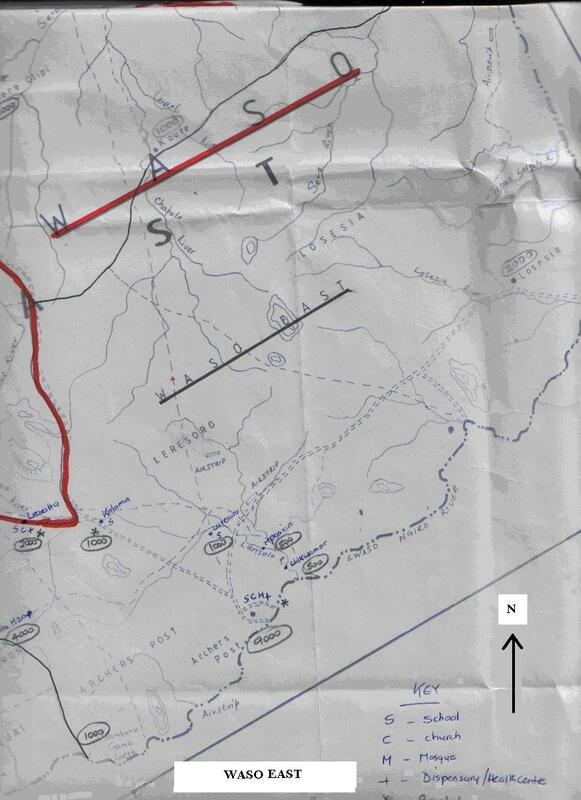 Most of the area forms a heavily forested (??) reserve (the future Samburu National Park) which has not yet been declared a national park but which is under the administration of the Ministry of the Environment ????? The area is believed to have a population of about 58.000 with an average of about 6 persons per family. The population is mostly made up of Northern Masai tribes. The people are mainly semi-nomadic pastoralists and still move around from one temporary shelter to another in search of water and pastures. About 90% of the inhabitants are illitreate. The primary school population is just 2000, while less than 100 children go to secondary school. Each of the three administrative divisions elects a councillor to the Samburu County Council, and together with the adjacent sub-district of Wamba elects one member to the national parliament. 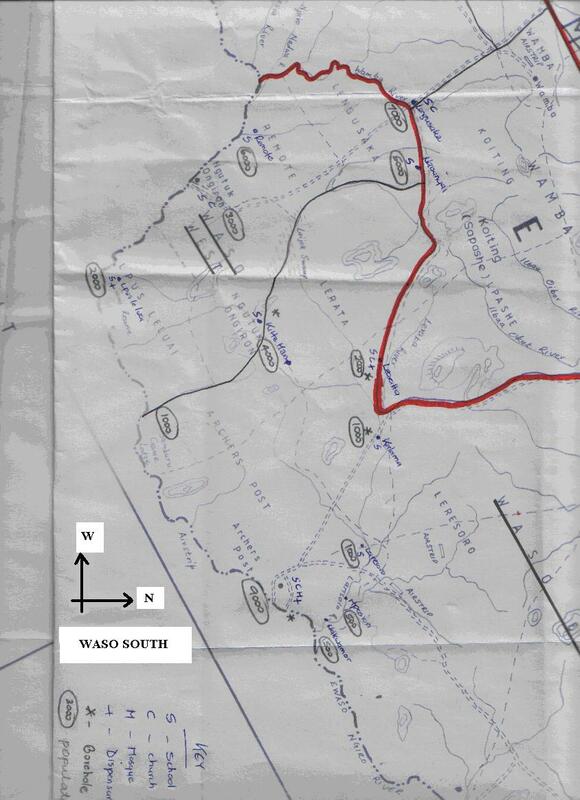 The local councillors, F.D.Lolosoli for East Waso, K.Leporole (West Waso) and Lendira (Sere Olipi) gave their formal approval in principle to this project on behalf of the Samburu County Council on 7th March 2003. The main town is Archer's Post in the extreme South of the area, on the border with the Isiolo district. Most of the people live off semi-nomadic pastoralism. More recently some have been trying to farm lands. The man is the main bread winner and head of the household. He controls the family wealth. Women do household chores, look after the children, and build shelters. The man herds, seeks employment, feeds, clothes and protects the family. There are rarely any surpluses, but if there are any, they are used to buy livestock. There is no individual landholding tradition. In pastoral areas people build temporary shelters. In the settlements semi-permanent or permanent structures are built and temporarily leased by the county council. The general economic situation of the people has been worsening. Dry weather conditions currently prevail. Livestock prices have experienced a downward trend due partly to cattle diseases (lumpy skin disease and east coast fever) and partly to the distance of the area from reliable markets. The people are forced to import even vegetables. For the few children who go to school, schooling is limited to learning to read and write. The school population is limited to about a thousand pre-school children and 2000 primary school children. Less than 100 children attend the only secondary school in the area. The very few people with more advanced education leave the project area in search of further education or jobs in the cities. The area has in general been neglected by the successive Kenyan governments. Available local resources include saltlicks at dry river beds, gemstones, wildlife, sand gravel and building stones. There is no electricity supply network in the project area, not even in the larger villages. Rural communities depend on other sources of fuel. Over 90% of the people in the area use wood fuel. The total lack of electrification in rural areas is perceived to be a major handicap to their development. The project area is arid. Average annual rainfall in the very arid parts is between 150-250mm, while in the arid parts it is 300-350mm. There is a short rainy period between October and November and a longer rainy period from March to May. The rainfall is not enough for crop production. The soil is sandy and its water retention capacity is poor. There is a general wide-spread scarcity of water for drinking, cooking, and washing. The average amount of drinking water currently available is only about 8 litres per person per day, while the commonly accepted minimum amount required is 20 litres. This water is used for cooking, washing, sanitation, and drinking. Wells are dug in the beds of rivers, most of which are seasonal. In some of the larger centres (Kitta Man, Archer's Post, Sere Olipi, Ndonyo Uasin) some of the people use water pumped from boreholes and springs. Water is not treated and water related diseases are endemic even in the larger centres. Women fetch the water, which is kept in small calabashes, sometimes in jerry cans, which hold 5- 20 litres. There is no training on how to keep these vessels clean. The average distance walked to fetch water from traditional river wells is 3km. This can be even further for catchment pools. The few available boreholes (there are just 6 of them in an area of 6000km2) are placed closer to the settlements, but even then women have to walk on an average more than 2km to reach them. Where people have to walk to running rivers for their water, this distance can be nearly 5km. Fetching water takes a good deal of their time and effort which could otherwise be used to improve the living conditions of the families. Supply of readily accessible clean drinking water should improve the health of the whole population and ease the pressure of work on women. Water-borne diseases such as malaria, typhoid, dysentery, gastroenteritis, and skin diseases are endemic. They affect the quality of life and the productivity of the people, and medicines consume vital parts of the incomes of those affected. In the larger centres, a few cement or PVC water tanks are available for a privileged few. Because of the semi-nomadic nature of the people, rainwater harvesting is practically unknown in the area. While there is a potential for the creation of (underground) water storage in or near seasonal river beds during the wet season, standard supplies of drinking water are expected to come from dug wells or drilled boreholes. Rain-water harvesting in or near river and stream beds is foreseen for small-scale cultivation during the dry seasons. Hot water is not available anywhere, except for cooking purposes. Locally available foods are wild berries, barks, wild fruits, gum, leaves, tubers, meat, blood, milk, and, since there is a small local bee-keeping activity, honey. Traditionally the staple foods were meat, blood and milk produced at subsistence level. Now maize flour has become the main food item, together with salt, sugar, tea and oils (fat) and 95% of food requirements are imported into the project area, causing disastrous financial leakage. There are no facilities, either collective of private, for the storage of food, which is not kept for more than 7 days. Malnutrition has been increasing in the district. Diet-related diseases as Marasmus, Kwashiorkor are manifest. Cases of malnutrition are highest among the landless population who, because of lack of ownership of land, cannot diversify their food production and intake. They therefore consume the available food (imported maize flour) with total disregard to its nutritional value. Cooking is the most energy intensive activity in the project area. Cooking is currently done by women and girls over an open fire in clay posts or deep factory made "sufurias" or pans. Cooking time varies from 15 minutes for maize porridge to 30 minutes and more for boiling meat. In the larger settlements this can lead to air pollution both inside the houses and in the community. Fuels used for cooking are wood in the pastoral areas and charcoal in the larger settlements. A "debe" (20 litre jerry can) of charcoal per day of wood costs 60 K. shillings (about Euro 0.65). Wood collected from the bush 6-10 km away costs K Shillings (Euro 0.33) per bundle. Large parts of meagre family incomes are therefore spent on fuel for cooking. The unsustainable use of wood leads to de-forestation and erosion, air pollution and health hazards. Moreover, the traditional cooking methods used are inefficient. 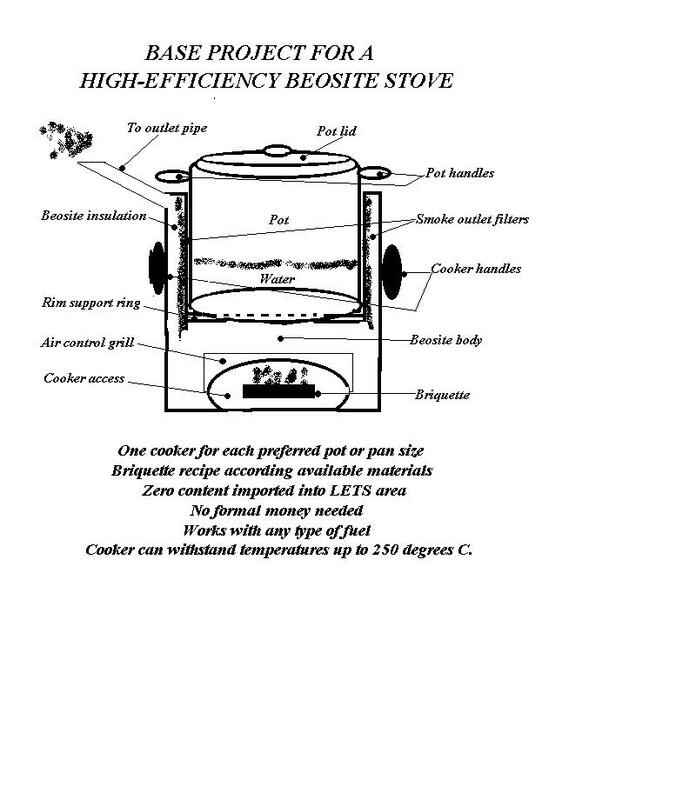 The project therefore introduces highly efficient stoves. They will be locally manufactured within local currency LETS systems. Bio-mass needed to produce mini-briquettes to fuel the stoves will also be locally produced and treated, without limiting the use of the natural fertilisers in local agricultural production. Locally manufactured solar cookers will also be introduced where daytime cooking does not contrast with local customs. The project will bring major savings in the costs of cooking. These savings alone will cover most if not all of the monthly contributions made by the families to the project. Little lighting is required in rural areas, except for cooking and eating. Some lighting is needed in homes and shops in the larger settlements. The wide-spread need for lighting for study purposes has been confirmed by the people. Inadequate and unhealthy paraffin lamps are being used for form four and other students. Firewood is mostly used for lighting especially in rural areas. Each family typically uses a bundle a day with a daily cost of K shillings 30 (Euro 0.33) or Euro 10 per month. Paraffin lamps are used in the larger settlements, at a cost of K.sh. 30 per half litre, with a monthly outgo of Euro 10. Current outgo for lighting in both rural areas and the larger settlements justifies the setting up of cooperative structures for the interest-free purchase of high efficiency solar lighting systems for individual homes. The few, poor quality (????? ), roads in the project area are classified as "all weather" roads, which is an important advantage for the project. In rural areas donkeys and occasionally camels are used for transport. In the settlements, pickups and trucks are more common. Transport if mostly used for household goods and foodstuffs. The distances covered can be considerable. Costs are involved only when pickups and trucks are used and a ride can cost anything between Euro 0.20 and more than 1 Euro, depending on the distance.. The means of communication in rural areas are scarce. Communication is usually by word of mouth, to pass on information and messages.. Games wardens communicate with walkie-talkies in areas where wildlife conservation is practised and for tourist security. Radio frequencies are controlled by the CCK (?????) and licences are a prerequisite. The use of a local radio system is considered very useful for security purposes and for passing on information. Telephones cost about Euro 0.06 per minute. Infrastructural development with improved means of communication are perceived to be very important in the project area. Even trading centres in the various sub-locations lack telephone services. Basic hygienic principles such as washing hands before meals and after visiting the toilets are not commonly applied. There are no courses available for training women. School courses do not include any basic introduction to personal and environmental hygiene. Hygiene education in the area must therefore start from scratch. The health facilities in all the sub-locations in the Waso area are inadequate to serve the populations. The health facilities are ill equipped and often experience shortage of drugs, so that patients may have to travel a long way for treatment. Only six localities (Lpus Leluai, Levatta, Archer's Post, Sere Olipi, Merille and Donyo Uasin) have a dispensary or a health centre. This imbalance can be only partly addressed under this project, which cannot substitute the basic obligations of the state. The major causes of infant mortality throughout the project area are malaria, diarrhoea, typhoid, HIV/AIDS and intestinal worms. The project can make an important contribution in the fight against these diseases by providing clean water sanitation and improved drainage, and by eliminating smoke hazards, stagnant waters, and ensuring a more varied diet. The people have generally no private sanitation facilities. Toilet structures (mostly in the towns) are made by use of locally available materials such as bricks, wood and stones. They mostly take the form of the VIP-ventilated improved pit latrine. Urine and excreta are disposed in the same latrine. The cost of building one of these VIP latrines is Euro 200 per latrine. People use leaves, papers and water to clean their bottoms. There are no specific cultural taboos concerning urine and excreta. Customs related to privacy when washing (women together, men together) have, however, to be observed at all times. Rural areas in the project area lack latrines altogether. Rubbish in the project area is mostly domestic. Rubbish is simply scattered anywhere and is reported as being "an eyesore". It poses a health hazard and allows flies, rats and other pests to breed. It also causes bad smells. The project includes setting up local recycling centres to add value to waste products. It enables recycling of some materials within the local currency systems. Export of residual waste materials will provide formal currency income to repay micro-credit loans advanced to the recycling centres. In rural areas women construct temporary shelters due to their nomadic nature. The shelters are made of branches and sticks and covered with mats made from local sisal, hides and skins or cows' dung. Those living closer to or in larger centres use cartons, pieces of corrugated iron sheet and plastics to make their shelters. In the larger centres, cement, clay, timber, local stones and corrugated iron sheets are used. Thatching using local down palm is also common. The buildings can be either temporary, semi-permanent, or permanent. Seasonal heating is not considered necessary. The project is centred on basic hygiene education, on the installation of sustainable sanitation, distributed clean drinking water, PV lighting for study, for the people of the Waso area in the Samburu district in Kenya, and on the supply of efficient stoves for cooking, the production of bio-mass to fuel them, and recycling at local level and disposal of non-organic waste. The project includes setting up Community Health Clubs for hygiene education and hygiene education courses in schools; provides sustainable toilet and wastewater facilities, wells (wherever necessary), pumps, and water tanks; establishes local exchange trading (LETS) systems to promote local exchange of goods and services; and implements an interest-free revolving micro-credit system to pay in formal currency for items and services originating outside the local communities. The project also refers to PV (photovoltaic) lighting for study and in clinics, and PV refrigeration for medicines. Any PV lighting needed for separate local production initiatives would be included within their respected micro-credit schemes. PV operated TV sets for education can be included. Private Solar Home Systems (SHS) will be introduced through self-terminating cooperative credit groups at tank commission level where users are financially able to sustain such obligations as well as meet their monthly contributions under the project itself. High efficiency stoves for cooking will be produced with 100% local value added as will the bio-mass necessary to fuel them. Recycling centres will be set up to recycle non-organic refuse within the local currency systems. The project cost is Euro 3,750,000, which can be 100% financed through an interest free loan with a 10 year repayment time. Of the interest-free loan, 75% is expected to be made available within the framework of the country programme of one or more aid partners, and 25% by the Government of Kenya. 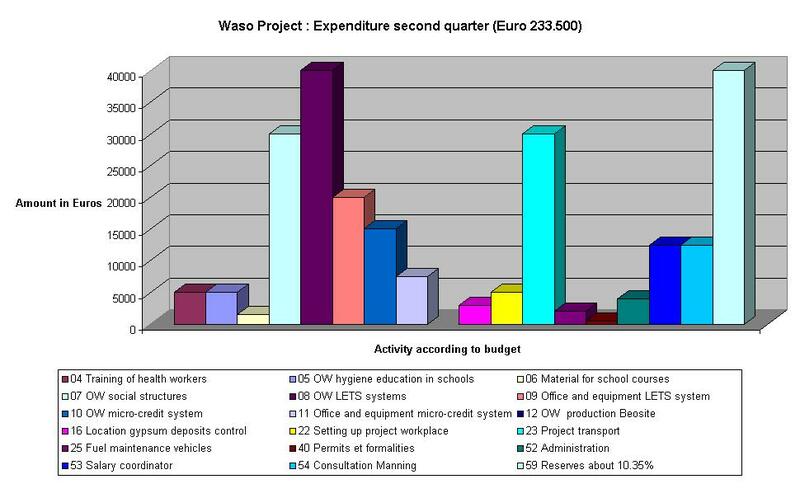 A detailed indicative budget is set out on page 38.
a) To extend existing hygiene education activities by establishing Community Health Clubs in the Waso area and promoting formal hygiene education courses in schools. b) To install technically appropriate sanitation for the people in the Waso area. e) To contribute to the fight against water-related diseases through hygiene education, the supply of appropriate sanitation and clean drinking water systems. h) To harvest rainwater for use in small scale cultivation during the dry seasons. i) To support improved educational facilities and enable students and others who wish to study in the evening to do so. j) To reduce the use of wood and promote reforestation and sustainable use of the Samburu National Park. f)To eliminate dependency on fuels imported from outside the project area. a)The project will be financed by interest-free seed capital in the form of a 'green' loan repayable over a period of 10 years. b)75% of this capital will be contributed within the framework of the "country programme" of one or more of Kenya's development aid partners, and the remaining 25% by the Government of Kenya through its (Water and Sanitation department). h)Users will be 100% responsible for on-going administration, capital repayments, and maintenance costs. Each household will pay a monthly contribution of Euro0.65 per family member (Euro 3.90 per family of 6 per month) to cover all on-going maintenance and capital repayment costs. The instalments will be to a large extent covered by savings on funds traditionally spent on fuel, water and waste removal and by way of registration for Carbon Emission Reduction certificates under the Kyoto treaty. q)The operation of the local bank (The Waso Cooperative Development Bank) to be set up may be supported by a international Green Bank to be named. r)The Samburu District County Council, the councillors from Waso, and the National Government (Department of Finance) have undertaken not to intervene to impede the development of the local LETS currencies either during or after the project period. e)The people of the Waso area must be able and willing to take full responsibility for all goods and services provided under the project and for its administration. g)The project will be self-funding. Savings on traditional fuel costs for cooking and services will cover most of the project costs. j)'Small is beautiful'. Small decentralized systems are to be preferred wherever possible. This promotes close contact of the people of the Waso Division with the installation and running of their own local infrastructure. 2.2 Willingness to pay at least the equivalent in Kenyan Shillings of Euro0.65 per month per extended family of 6 (the equivalent in Kenyan shillings of Euro 3.90 per family of 6 per month) into a Cooperative Development Fund. This payment covers the entire package of basic services foreseen including hygiene education, drinking water supply, sanitation, waste removal, high efficiency stoves and fuel for them, and lighting for study purposes. The NGO officially fronts for the project. Its constitution and statutes are attached to this project as Schedule 11. The members of the board of the NGO Paran are fully representative of the people in the Project area and enjoy the full confidence and support of the people. Their functions are honorary. The NGO approves the project and presents it for financing within the framework of a country programme supported by a donor government. Peter Gatuna is responsible, together with Terry Manning, for the project preparation, for contacts with local authorities and banks and with the users, for the actual implementation of the project. Gatuna is also responsible for all professional work or operations that cannot, at the time of the project, be provided from within the local communities. He is also in charge of the maintenance of the project, for collecting the monthly contributions of the users (through the tank commissions) and for general supervision of payments out of the project accounts. Mr Gatuna will also coordinate the establishment of the local Gypsum composites production units and the network of recycling centres. Mr Gatuna's fees are in the public domain and formalised in the Project budget. See Schedule 2 for information on Organizational Workshops. The Organizational workshops will typically directly involve about 5.000 users representing some 15% of the adult population. The administrators of the country programme(s) who agree to supply external funds will, on acceptance, make available its 75% share of the interest-free loan necessary for the project and nominate structures and channels for supervising the project expenditure and liaising with other parties. The Kenyan funding Authority will be an enabling body only. It will guarantee the continuity of the local currency (LETS) systems. Before the project begins, it will guarantee transfer of ownership of the project to the local communities when the seed loan is repaid. It will ensure, by agreement with the Central Government, that goods imported for the project come into Kenya Duty Free. It will authorise without creating unjustified obstacles the siting of boreholes, wells, feed-pipes, tanks and others structures necessary to the execution of the project. It may take full political credit for the project, but will agree not to otherwise intervene in its organisation, implementation or day to day running. The local MP, Mr Sammy Leshore, has agreed to do everything in his power to guarantee respect by the national, regional and local administrative authorities the continuity of the local currency (LETS) systems, the importation of goods destined for the project without the application of customs duties taxes or other formal levies, and the transfer of the project structures to the users. He will act as liaison points between the Project Coordinator on the one hand and the Kenyan funding authority and the local political institutions on the other. He may take full political credit for the project, but will agree not to otherwise intervene in its organisation, implementation or day to day running. The Samburu County council will formally approve the project. It will act as an enabling body. It may take full political credit for the project implementation, but will not otherwise intervene in the organisation, implementation or day to day running of the project. It will guarantee and respect decisions of the vested authorities in relation to ownership of the project goods and services, and fully support the local currency (LETS) systems and the duty-free entry into the project area of goods to be used in the project. The council will approve reasonable project proposals for laying and embedding water pipelines to dedicated water tanks, drilling bore holes, digging wells, locating and building sanitation facilities, siting of Gypsum composites manufacturing units, siting of, and collection of rubbish by, recycling centres. The Ministry of Health is directly responsible for health services in the project area. It will respect the administrative decisions taken by the Samburu county council relating to the Project and will approve of the use of its own Health Workers within the framework of the Community Health Clubs' hygiene education programme to be set up by Zimbabwe A.H.E.A.D. Full advantage will be taken from existing initiatives. The health authorities and the water and sanitation committees operating under the District Water and Sanitation Programmes (WASP)will approve that their workers be paid in the local LETS currencies for any work not already covered under their existing salaries. They will approve that ownership of drinking water facilities, sanitation services where supplied, PV lighting, PV refrigeration, and water testing equipment placed in clinics within the project area be vested in the tank commissions in whose areas the clinics are situated. They will support formal hygiene education courses in schools in the project area. They will reach an agreement with the project coordinator to ensure training of (women) users at on-going checks of water quality, and systematic inspections of the sanitation facilities built within the framework of the project. Testing and inspection work not already included within the Health Workers' salaries will be paid for in the local LETS currencies. The equipment for conducting such systematic water quality tests will be made available under the project to a local clinic or hospital and financed by testing work carried out by the clinic for third parties outside of the project area. The health authorities will help train people to make regular hygiene inspections of the local recycling centres. The education authorities will approve that ownership of drinking water and sanitation facilities and PV lighting placed in schools within the project area be vested in the tank commissions where the schools are located. They will also approve that the teachers' commissions nominated to operate water and sanitation services and PV lighting report to the local tank commissions. They will support hygiene education courses in the schools in the project area and approve the reasonable course curriculum presented by the Project Coordinator and apply it during normal school hours. After its institution, the Waso Cooperative local development bank will administer project funds actually deposited in the Waso County in Kenya. On the instruction of the Project Coordinator, it will formally administer Grameen Bank style interest-free micro-credit loans and repayments and the project funds, in cooperation with the External Green Bank. It will NOT intervene in the decisions relating to the granting of the loans themselves which will be made by the project coordinator in consultation with the communities. All shares in the bank will be held on trust for the people of the project area. The external funding authority will pass its financial contribution through an appropriate financial institution, where possible a Green Bank willing to act as adviser to the Waso Local Cooperative Development bank. The external Bank will, on the instruction of the project coordinator, administer the project monies deposited in Kenya, under the supervision of the External Funding Authority and will support the Waso Local Cooperative Development Bank in setting up the Micro-credit system for local development. They will nominate a litreate person to liaise with the local LETS system coordinator. PV lighting, PV refrigeration, and water testing equipment supplied to clinics in the project area will likewise be run by the medical commission supervising the water supply. Ownership of these structures will be vested, with the consent of the Health Authorities, in the tank commissions where the clinics located. The medical commission will report to the local tank commission. The tank commissions will set up local cooperative groups for the purchase of PV solar home systems. Medical commissions will supervise installations supplied to clinics under the project. They will report to the tank commission where the clinic is situated. They will where required arrange with the Project Coordinator collection of special medical waste products. They will support and apply the approved hygiene education courses in the schools. Financing parties may nominate an independent auditor to co-sign payment authorisations made by the project. 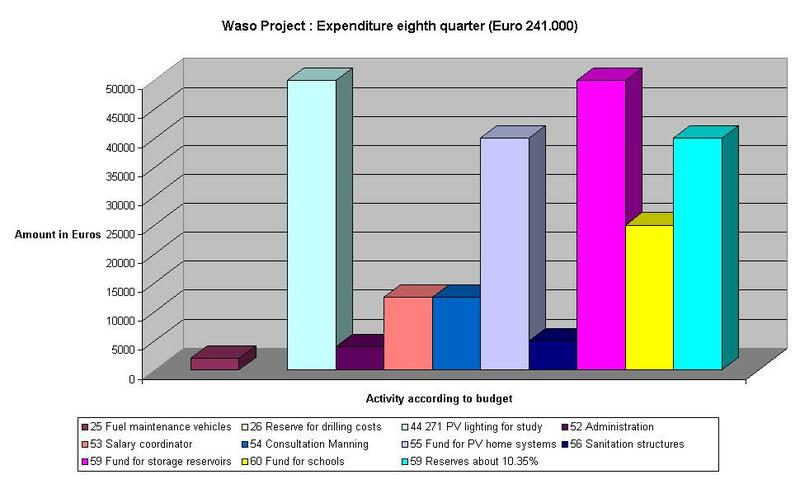 The independent auditor answers to the project NGO. See par. 6.14 for more information. As project structures are completed, ownership in them will formally pass to the people of the Waso Division, through the Tank Commissions. Until all debts have been repaid, the project coordinator retains the right to recover any installation supplied under the project should the people not meet their financial obligations for them. The interest free loans will be repaid over a period of 10 years. Until repayment has been completed, the project coordinator will retain formal responsibility towards the funding authorities for maintenance and administration. Ownership of drinking water installations, PV lighting and refrigeration and water testing equipment installations in schools and clinics will be vested in the tank commissions where the schools and clinics are located. Ownership of PV lighting sanitation services and refrigeration installations in clinics outside the project area serving users inside the project area needs to be separately discussed. As the project is cooperative in nature, the participating parties, and in particular those financing the project, are free to impose appropriate reporting and verification procedures which should be simple and direct to eliminate "red tape". Users repay the interest-free loan after ten years. At that point of time they will have been repaying the loan at the rate of the equivalent in Kenyan shillings of approximately Euro 0.75 per family member (or the equivalent in Kenyan shillings of Euro 4.50 per family of 6 per month) for 120 months. Their repayments are, however, made in the local (formal) currency. Should the local (formal) currency through inflation or exchange measures have devalued against the Euro, the amount in local currency collected by the users will not be sufficient to pay the original loan back . This situation is beyond the control of the parties to the project, and in particular of the users. Long term political stability in Kenya is essential to the success of the project, especially during the period of the ten year interest-free seed loan. Without it ongoing integrated development cannot be guaranteed. While capital structures installed within the framework of the project may, if rarely, be insurable against loss or damage by Act of God such as lightning, hurricanes, or earthquakes, it is not possible to insure them against loss or damage deriving from causes such as Act of Political and Military Authorities, civil war, commotion, rebellion, and strikes. Even if insurance against such risks were to be available the cost would be so high that it would constitute a major on-going financial leakage from the project area, which is just one of the major problems applications under the Model are designed to stop. What happens in case of loss of or damage to the capital structures installed under the project Model before repayment after ten years of the interest-free seed loan must therefore be clearly addressed at the time the project application is being financed. Normally, at the time the (uninsured) loss of or damage to the capital structures occurs, users will have paid a part of the loan into the Cooperative Development Fund. - Incoming through information shops set up as private businesses (as in b) " local consultants") under the project. These would have telephones, faxes, computers. - Outgoing, through cultural and economic websites ( recent experiments in India), where individual interest groups make their cultural activities and their wares known to the outside world, either independently or through the information shops. 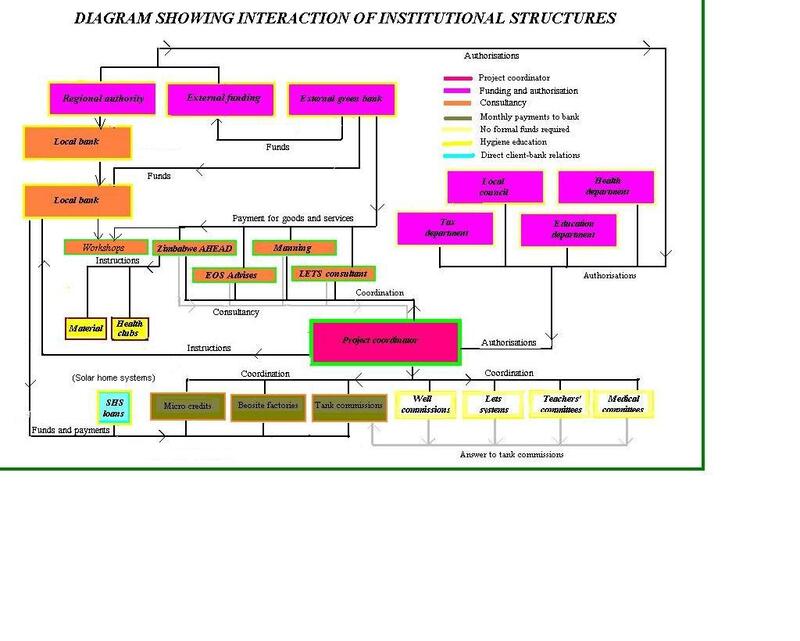 Within each of the above specific sectors, rather complex interdisciplinary relationships can arise. Just to cite one typical example, to make the integrated sanitation system foreseen work, users need to be advised on the benefits of better hygiene (Health Clubs) then practise what they have learned and install their new toilet (and, eventually, water harvesting) systems. A system of cooperative inspection then needs to be put in place. A home inspection report has to be developed. Local women nominated by the tank committees have to be trained to apply the report system and to advise and help users where they are doing something wrong. Women nominated by the well commissions have to be trained to monitor the work of the local inspectors. A woman nominated by the (unified) well commissions will have to check the work of the well commission monitors. Information and experiences would need to be exchanged both vertically and horizontally under a). The same users will at the same time need separate instruction on how best to recycle their urine, and later, their composted faeces. 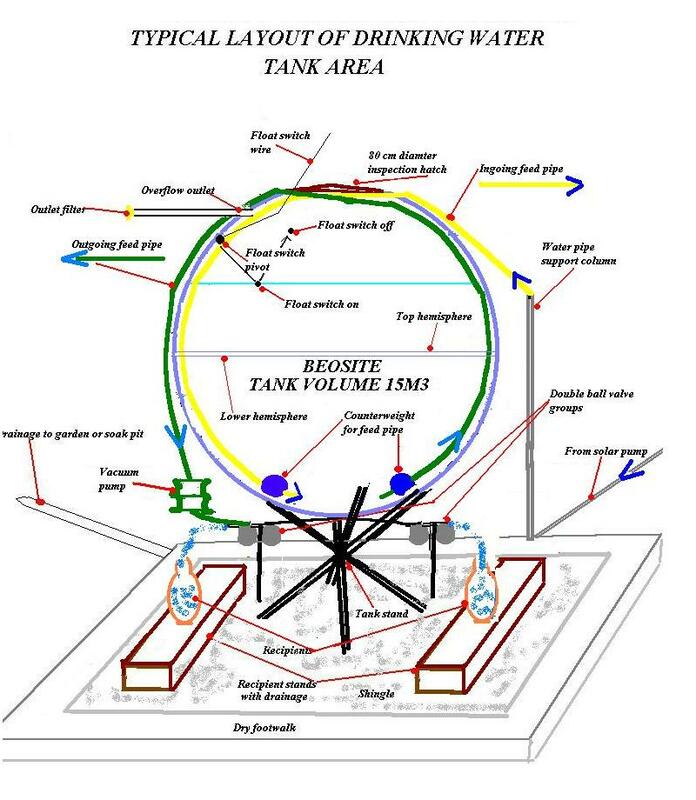 Basic recommendations will be developed under the projects for this, although single users, the local tank commissions, or the project coordinator could also obtain consultancy under b). Where the project supplies recommendations, cooperative structures similar to those described for hygiene would need to be developed to make sure they are applied properly. 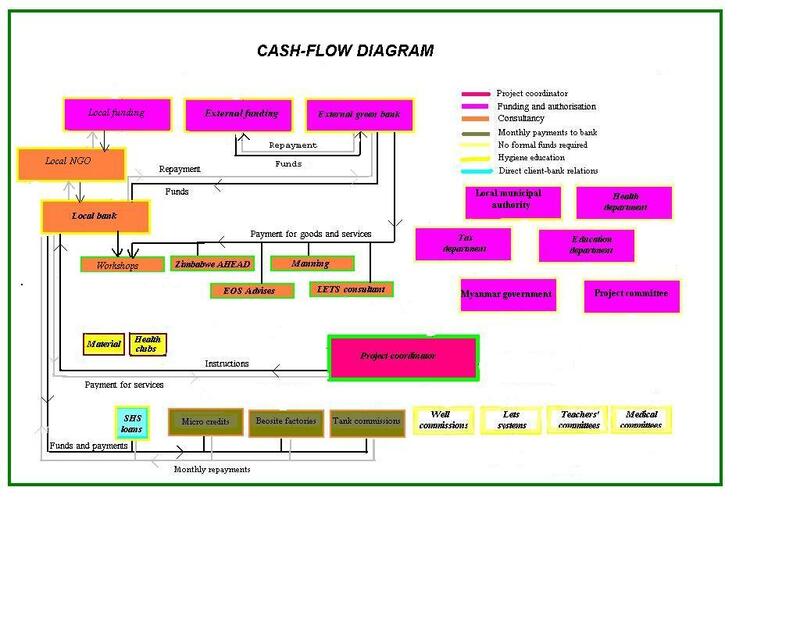 Purchases in formal money of capital goods for production purposes will normally need to be imported into Kenya. The first series of such purchases is usually made with the original loan funds. Since the original loan funds are made available in Euro or other leading international currency, and converted into the local currency for the purposes of the project, their re-conversion where necessary from the local currency into the international currency should not pose a problem. A condition for the granting of an interest-free loan under the project is, normally, that the beneficiary be able initially to sell some of the goods or services in question outside the project area for formal money to enable him to repay the loan. The beneficiary therefore exports the goods or services outside the project area for formal local currency, but not necessarily outside the national borders. Since capital goods may often need to be imported into the country where the project area is situated, a situation of financial leakage of formal national currency occurs for the purpose of buying the foreign currency necessary for the purchase of new capital goods for production purposes. This financial leakage is not desirable but it may in part be offset by the increase of local production tending towards a reduction in the need for imported goods. The leakage can only be completely avoided where the project area succeeds with time to export directly outside national boundaries enough of its production to earn enough foreign currency to cover the costs of the imported goods. It is unlikely this be possible at least in the early phases of a project application. The local government must therefore when it approves a project application under the Model accept that this (temporary) financial leakage is going to take place during the initial stages of the project. Its Finance Ministry must ensure flexibility in granting leave to convert local formal money into the foreign currency necessary for the purchase of the capital goods. Failure of the Ministry to do so would in practice lead to serious delays in project execution. 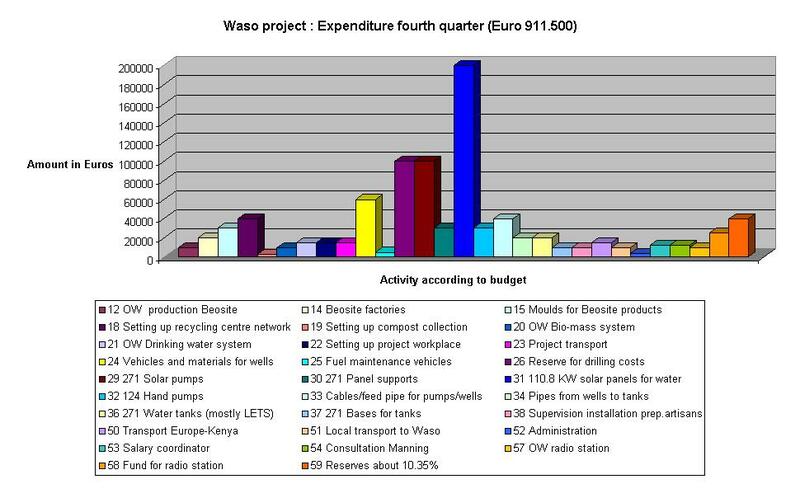 The more often the project funds are recycled the more rapidly the project area will develop. The Project Coordinator, on the other hand, is bound to endeavour to reduce the financial leakage of formal currency in question by purchasing capital equipment, where available, which has already been imported and is available on the local market. The project is based on separation of powers between the controlling party (the NGO Paran) and the project coordinator nominated by the NGO to execute the project. 1. The project NGO fronts for the project and maintains on-going auditing powers to ensure correct project execution. 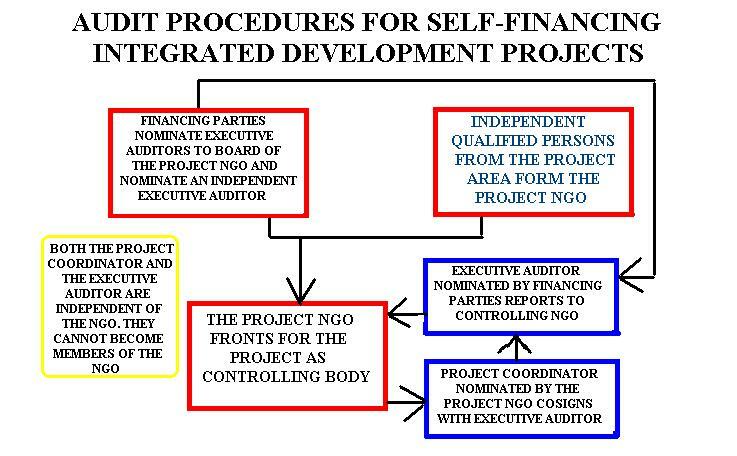 The statute of the project NGO allows the financing parties to nominate executive auditors to the Board of Directors. The nominated auditors may be paid salaries by the financing parties. For practical purposes they should be resident in or near the project area. The NGO does not intervene directly in the execution of the project, as this is the responsibility of its nominee project coordinator. 2. Financing parties may also nominate an independent auditor to act the with project coordinator to co-sign payment authorisations and conduct an on-going audit of project out-go. The independent auditor answers to the Board of the NGO, which includes executive audit nominees of the financing parties. His salary is paid by the financing parties. The independent auditor may not intervene in the running of the project itself. For practical purposes the independent auditor must be resident in the project area. To avoid conflict of interest,neither the project coordinator nor the independent auditor may be a member of the NGO. They both report, independently of each other, to the NGO. For some indicative information on the courses, refer to Schedule 7.BASIC COURSE FOR HEALTH CLUBS. This material is subject to adaptation according to the preferences expressed by the Workshop participants. Hygiene education courses will be established in the schools in the project area. They will be supported and approved by the local Health and Education authorities. They will be applied during normal schools hours under the supervision of the teachers' commissions. The number of users for each toilet unit will be decided during phase 2 of the project based on users' preferences and customs in accordance with the decisions reached during the organisation workshops to be held. Units could be for an individual or a group of related families. A typical unit will comprise a small toilet building containing three Gypsum composites tanks. One tank will be used for urine. The other two tanks will be used as aerobic composting toilets. Building support structures, san-plats for urinals and toilet seats will also be supplied by the local Gypsum composites production units. The toilet structures will be built by local builders or cooperative groups and paid for using the LETS local currencies. Use of improved evaporation systems could eliminate one of the composting toilets. For health reasons we prefer the twin tank method. 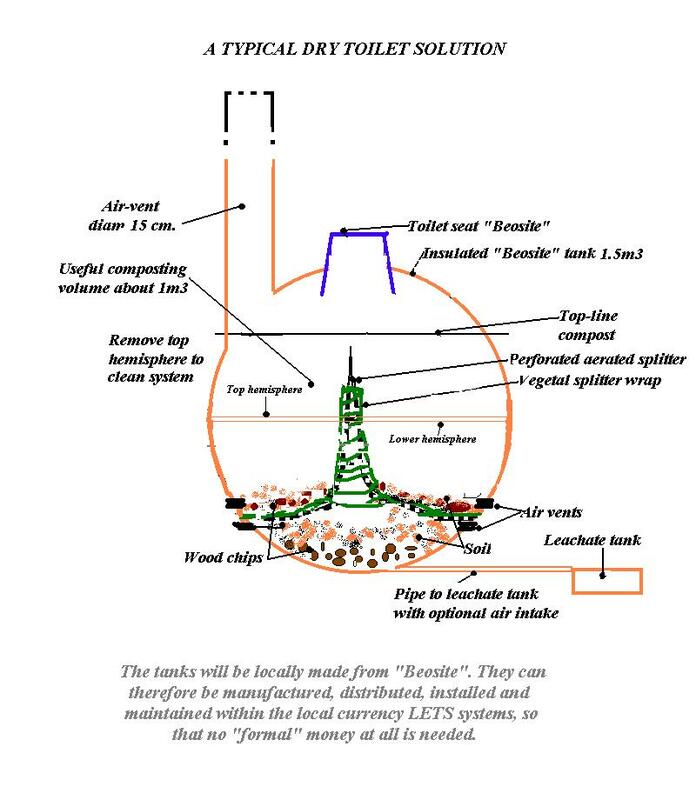 A small quantity of locally available lime, ash, sawdust or similar would be added to the urine tank once or twice a day and to the faeces after use. The contents of the urine tank can be emptied at any time. A mixture containing one part urine and ten parts of water can be safely used for watering plants. This high quality product has been known to more than double the productivity of a household garde. An average family with 6 members can produce about 30m3 of this fertiliser per year. Users not wishing to dispose of the urine themselves will hire local operators to do it for them under the local LETS currency systems. The development using LETS currencies of a collection system may be needed in poor urban areas where users have no gardens or are unable to dispose of their urine. In urban areas, grey water may need to be regularly collected, possibly together with urine, and taken to the countryside nearby where it can be recycled. This work would be done under the local LETS currency systems. Non-organic solid waste products will be recycled in recycling centres operating under the local currency (LETS) systems, creating more local added value. In larger communities the centres may be specialised to some extent. Collection charges will depend on the kind of material being recycled. Environmentally harmful materials will be charged for at a higher rate than other materials. Special waste from clinics will be addressed separately. A practical alternative to concrete, is to use a new-age product like Gypsum composites. Gypsum composites production units can be established wherever there are local deposits of cheap gypsum (CaSO4 + water) or anhydrite (CaSO4 + 1/2 water) which are very common, occurring naturally in most parts of the world. They can be used to make cheap, ecological, hygienic tanks, well-linings, toilets and other products. Gypsum composites is a state-of-the-art technology originating in the Netherlands. It can easily be transferred to Kenya. The Gypsum composites production units can make a major contribution to the regional economy after the project has been completed as well as manufacturing the products needed for the project itself. While the workshops will work out the details, it is foreseeable that the Gypsum composites production be highly labour intensive calling for minimum capital outlay. The products can be made manually without the need for any machinery, with a western-level finish. PREPARATION OF GYPSUM COMPOSITES PRODUCTS. 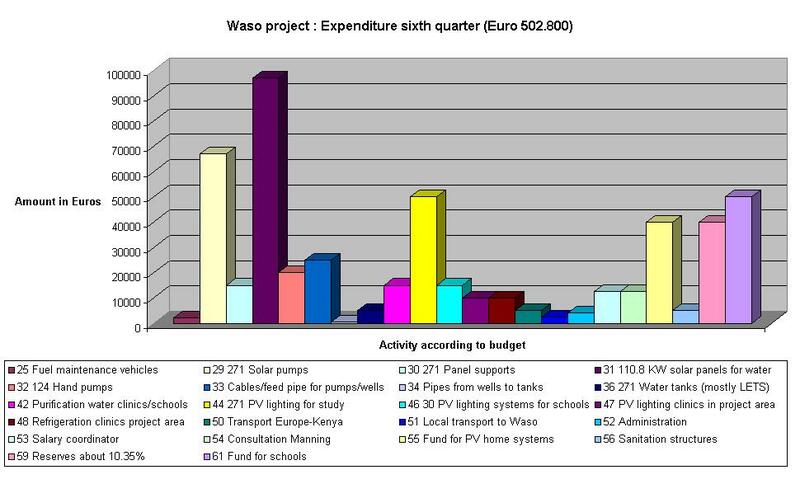 Organised drinking water supply systems in the Waso Division project area are limited to (part of) the larger towns. This project will be decentralised. Large diameter boreholes will be drilled using local labour, construction methods and materials supplied under the local LETS systems. About 6-9 solar submersible horizontal axis piston pumps will be installed in each borehole. Each of the pumps will supply water to a dedicated water tank serving a local community. The well is the hub of the supply system. The water pipelines radiating from it are its spokes. Each borehole will be equipped with back-up hand-pumps (see Schedule 5 for a complete description of the hand-pumps). The hand-pumps will provide minimum water facilities during unusually long periods of bad weather. The drinking water supply is based on a water consumption of 25 litres per person per day. Since solar energy is to be used to pump the water, bad weather must be taken into account. For that reason, the tanks need to have a capacity for three days' use. Each tank will supply about 200 people. The capacity required to give 25 litres per day to 200 people for three days is 15m3, the planned size of the tanks. Where the water table is not deep, hand-dug wells instead of drilled boreholes will be prepared. 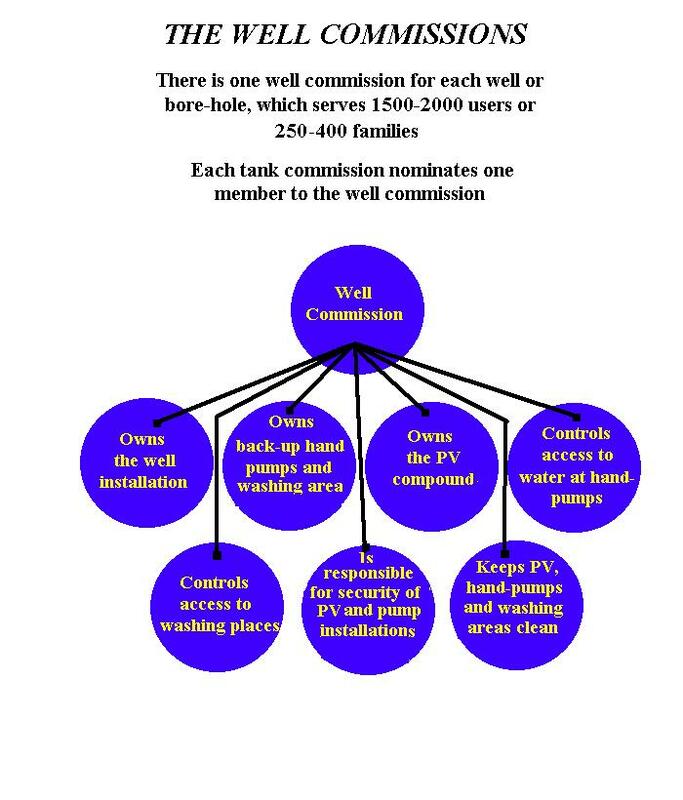 According to the wishes of the people in each tank commission and/or well-commission area, existing water supply structures can be upgraded to the requirements of this project and possession in them handed over to the tank commissions and well commissions who would then be responsible for their administration. Permanent on-going procedures to maintain and administer the system will be worked out with the users themselves during Organization Workshops to be run for this purpose, with the involvement of Terry Manning as consultant, the project coordinator, the tanks and wells commissions, maintenance and inspection staff, and the local private bank that administers the micro-credit loans. Structures to be created include the Health Clubs, the local money systems, the Gypsum composites factories, systems for installation and maintenance of the drinking water supply system, waste recycling structures, structures for the production of bio-mass, the local banking and micro-credits system, the tank and well commissions, not to forget the local radio station. Many goods and services like those provided by the Community Health Clubs, and those needed to build the sanitation and water supply services can be paid for using the LETS systems. We have included some formal currency estimates for these goods and services so that enough micro-credit loan money is available to start developing local production. LETS systems will be set up in Waso West, Waso West and Waso North. 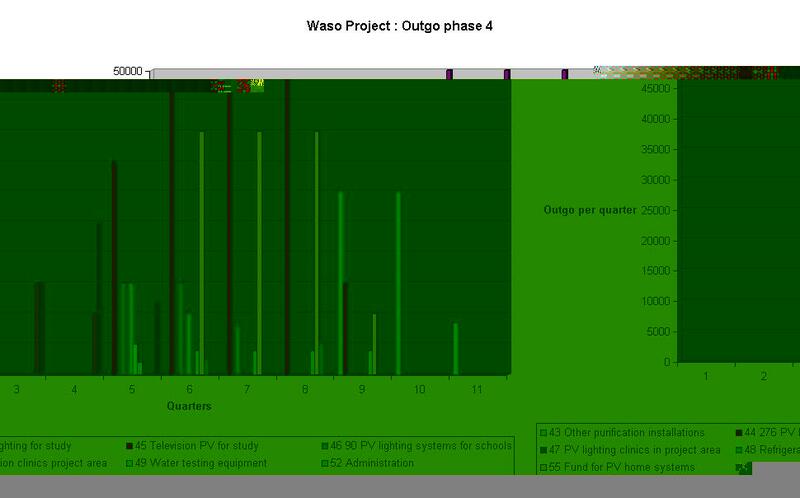 Enough money has been set aside in phase 4 of the project to cover 375 PV lighting systems. The purchase of PV lighting and refrigeration for clinics in the project area is covered. 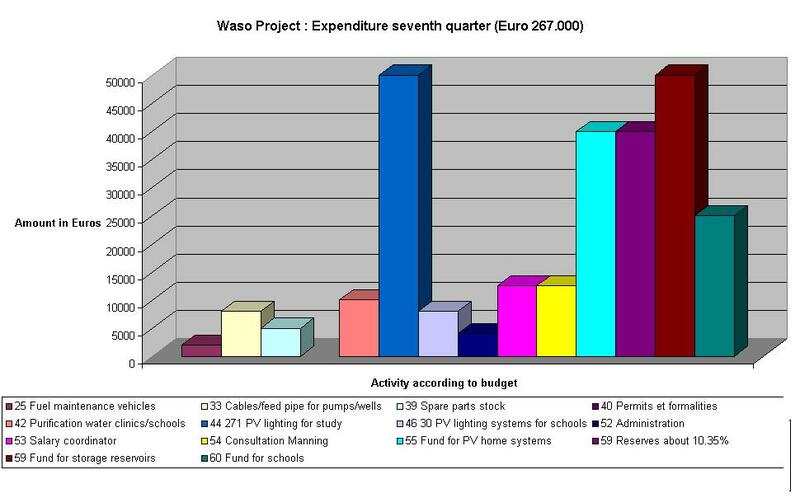 PV lighting facilities for evening classes in schools has also been included in the budget. This has been set at two sets per school pending more information on the individual schools and their real needs with respect to evening classes. 3.07 Domestic solar home systems. Home lighting in the project area is usually fuelled by wood and kerosene lamps and the average cost of which is about Euro 10 per family of 6 per month. Kerosine costs about Euro 0.50 per litre, and an average family uses about 20 litres per month. This outgo constitutes a serious financial leakage from the project area which should be stopped. Some families may be able to finance the purchase of solar home systems through savings effected on the costs of petroleum and, for instance, batteries consumed for radios. The project will set up a separate cooperative interest-free fund level under which solar home systems can be installed and more efficient radios purchased within interest-free self-terminating building society structures set up at tank commission level. The tank commissions will decide the social priorities for the gradual distribution of these systems. They may for instance decide priorities by drawing lots. The seed fund is purely to set an example, and cannot supply more than 150-200 systems to launch the system. The rest of the money must come from the cooperative contributions made by the users participating. The speed of the distribution of the systems will depend on the time required to reimburse the credits received by each family. A family accustomed to paying Euro 10 a month for lighting and batteries will be able to repay a system from savings within about 4 years. A poorer family would need more time. Alternatively each family can pay an affordable amount into the Tank Commission fund and new systems distributed by lot each time there is enough money in the fund. Distribution of solar home systems is expected to commence in the last, phase 4, of the project. Various activities currently cause of financial leakage from the project area will then be taking place under the local money (LETS) systems, and it is conceivable that (some) users have more formal money available than before. They can therefore form buying cooperatives for solar home systems at tank commission level, whereby each family contributes an amount (eg Euro5) each month into its cooperative lighting fund. This would allow one family out of 20 to install a system each 16 weeks. This would mean that each family would have a solar home system installed within about 6 years after the start of the cooperative and the elimination of financial leakage from the project area due to lighting and radios within 6-7 years. Financial leakage through the use of inefficient battery-driven radios could be stopped by the use of high efficiency radios and/or mechanical wind-up radios. It should be possible to recover the cost of the new radios through savings on batteries within one year. 3.08 Water harvesting for underground storage. Arid conditions with a very low rainfall dominate the project area. Numerous water courses form in spacious catchment areas during the rainy season, often because of the limited capacity of the dry sandy soils to absorb rainwater when it does fall. For health reasons, and because of risk of loss through evaporation, harvesting part of this water in open ponds and reservoirs is not considered a valid option. An alternative is creating underground water storage facilities in or near river and stream beds for use for value cash crops during the dry season. These storage facilities are of special interest to the local people. They will be placed in the vicinity of inhabited centres for small scale gravity drip irrigation of cultivated plots. Based on a water supply of 20m3 per day per hectare, water storage needed for a dry period of 200 days amounts to 40000m3 per hectare. Assuming each family cultivate an average area of 500m2, each hectare will contain gardens for 20 families. The total amount of water to be stored is 19.320.000m3. This represents an area of approximately 10km2 with a depth of 2 meters. While most of the costs of constructing the tanks are expected to be covered under the local money systems, a reserve has been set up to meet imported costs eventually involved. The tanks will become the property of the tank commission or the well commission in whose area they are built. The establishment of a local radio station is an integral part of the project. The station is a part of the management of communications concerning the project. Radio is an excellent way to spread information on the project developments and the management of the structures set up. It also enables users to discuss initiatives taken and to be taken, and to express their criticisms. It can also become a vehicle for local commerce. The station will have two transmitters one placed in Kitta Many and one in Sere Olipi so as to limit the transmission radius. A PV operated station may be preferred to one running on "imported" electricity, as this increases the autonomy of the station and reduces long term financial leakage from the project area. It is not the purpose of this project to substitute the state's obligations for the supply of proper scholastic structures in the project areas, except for safe drinking water, sanitation facilities, and, eventually PV lighting for evening classes. Formal currency investments in school structures are not susceptible to the rapid interest-free re-cycling of funds at the basis of self-financing development projects. c) The local Gypsum composites factories. d) Reproduction of didactic material through PV television systems and/or through documentary reproduction by local consultants set up under the micro-credit systems. 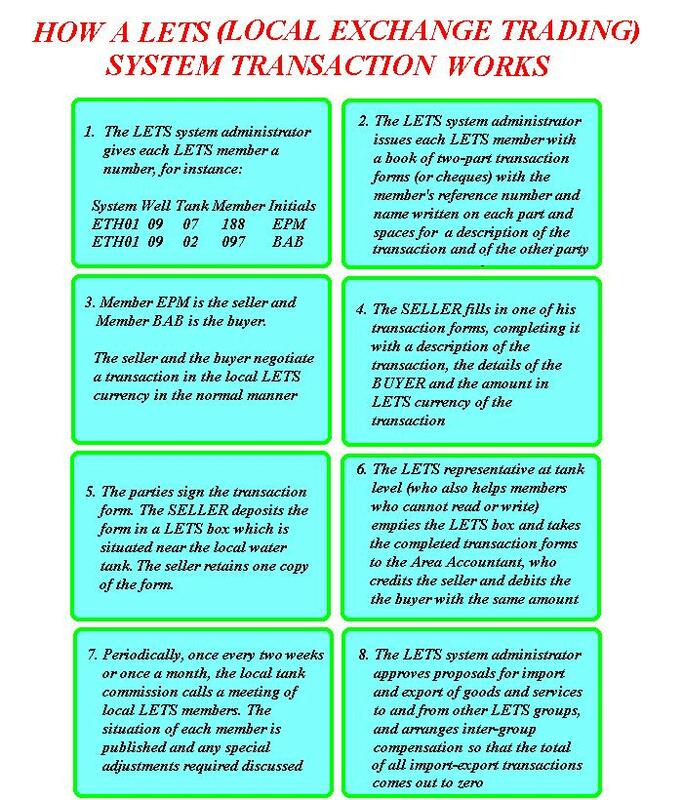 Groups of parents and or groups of tank commissions can take initiatives under the local money systems and distribute their costs (expressed in LETS points) amongst the groups directly involved. In this sense the groups involved can be registered under the LETS systems in the same way as clubs or other social groupings. The above comments apply both to basic education structures (primary and secondary schools) and to ("polytechnic") structures where young people can learn a trade after leaving school. The local people have indicated a high priority for this form of practical education. For these schools an application will have to be made to the Department of Education of the State of Kenya to contribute the remaining formal currency costs. A fund has been set aside to enable the project to take practical steps to further educational structures in the project area. 3.11 Payments and on-going costs. 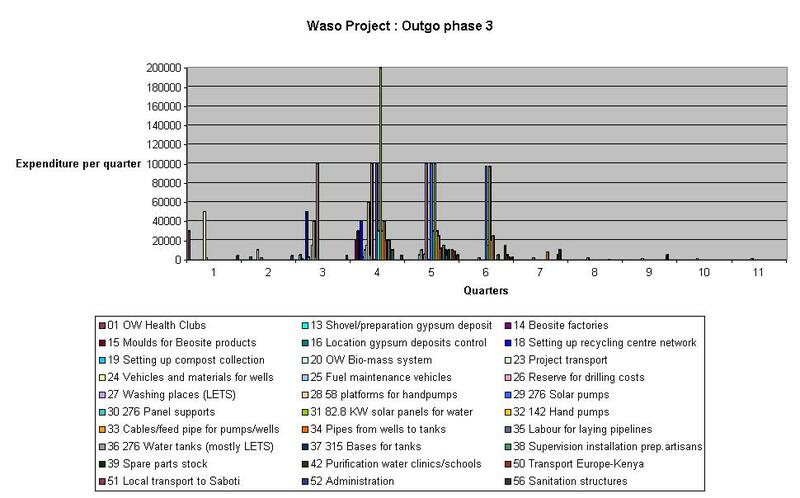 The following drawings and graphs form an integral part of this project proposal. 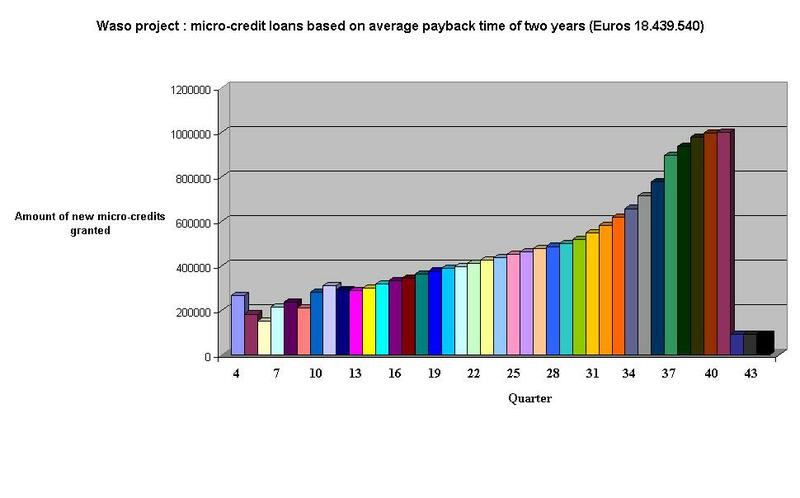 GRAPH SHOWING DEVELOPMENT OF MICRO-LOANS. 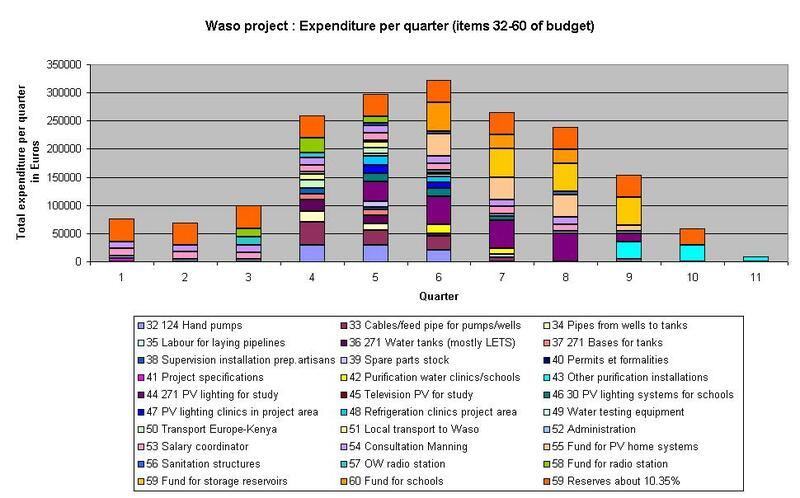 TYPICAL PROJECT EXPENDITURE BY QUARTER (Items 1-28 of the budget). The people of the Waso Division area in the Samburu County in Kenya are poor and plagued by a low quality of life. The initial seed capital will therefore come from donors in the form of an interest free loan repayable over a period of ten years. - to repay the loan itself. This money will be re-cycled interest-free for use as micro-credits to develop local production capacity. Once the original seed money has been repaid, the monthly payments will create a large fund for use to extend the basic services provided under this project. There will be large savings in the traditional cost of fuel for cooking. The savings will come from using high efficiency Gypsum composites stoves and local production of bio-mass for fuel. Provision of drinking water under the project will help avoid health hazards, improve productivity, and avoid the need to purchase expensive water from vendors in the larger communities. Waste re-cycling under the project will produce savings by creating value added from resources currently unused and because payments for collection and handling of the waste will be kept inside the local economy. Relevant details have been collected and a budget developed. Contacts have been made with potential suppliers and the basic project technologies selected. The project coordinator has contacted the local people to discuss their wishes and willingness and ability to meet any net financial commitments under the project after taking into account direct savings. 4.1.2 Willingness to pay the equivalent in Kenyan shillings of at least Euro 0.75 per family member (or the equivalent in Kenyan shillings of at least Euro 4.50 per month per average family of 6) into the Waso Cooperative Development Fund. This payment covers the entire package of basic services foreseen (hygiene education, drinking water supply, sanitation, waste removal, high efficiency stoves and fuel for them, and lighting for study purposes. 4.1.5 Acceptance of industrial quality dry composting toilet systems with the separation of urine and excreta. Aspects relating to the form, the colour, the finish, privacy and similar will all be discussed with and decided by the users. The dry toilet systems foreseen enable waste to be recycled at household level so that problems connected with the pollution of surface and ground water can be addressed at local level without the need for major investments. The key project sites including clinics and schools are shown on the map of the project area and on the settlement schedules, all of which are included in Schedule 3. 4.2 Second phase lasting about 9 months. 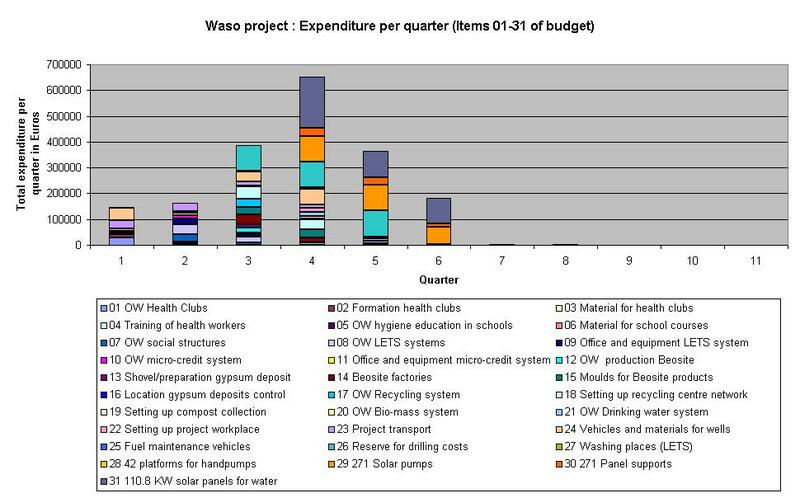 TYPICAL PROJECT EXPENDITURE BY QUARTER (Items 1-21 of the budget). 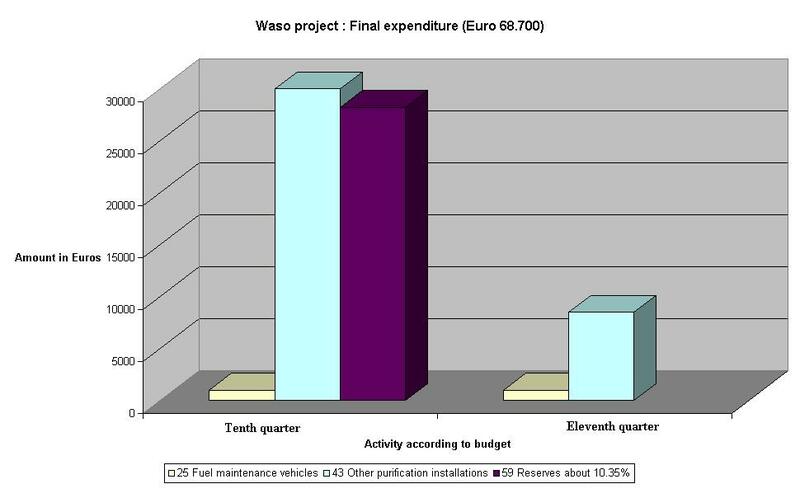 TYPICAL PROJECT EXPENDITURE BY QUARTER (Items 22-58 of the budget). The sequential order of the workshops is very important. The first workshops are the ones setting up the Health Clubs, which offer women a platform from which they can organise themselves. After that, the tanks commissions, which are the heart of the system, can be established. 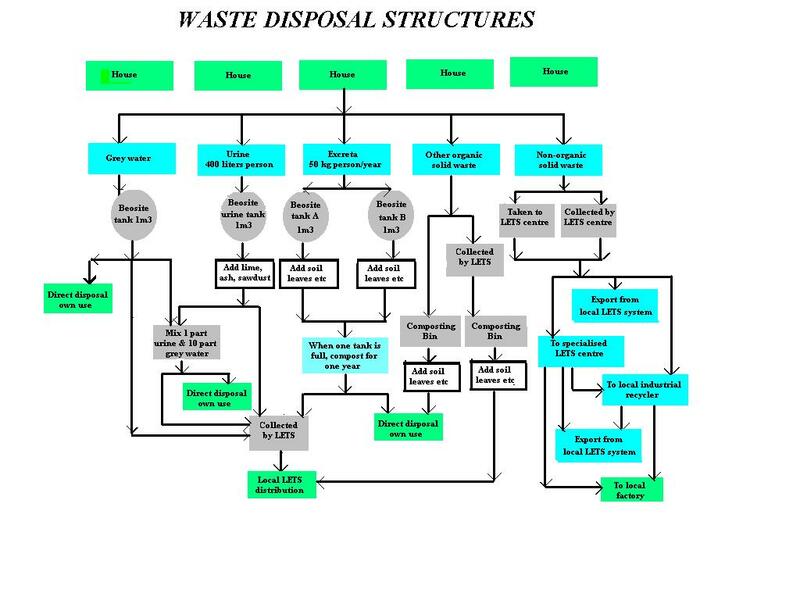 The third structure is the local money LETS systems, followed by the micro-credit system, the Gypsum composites factories, the water supply system, the recycling system and the radio station. A plan for the effective payment of the project funds to the local NGO is prepared. Since the local Waso Cooperative Local Development bank will be instituted later on, if no suitable banking institution is present in the project area, the funds will have to be paid into a temporary account in the name of the NGO in Nairobi or the nearest larger town with a suitable bank. 4.2.1 HEALTH CLUBS AND HYGIENE EDUCATION IN SCHOOLS. 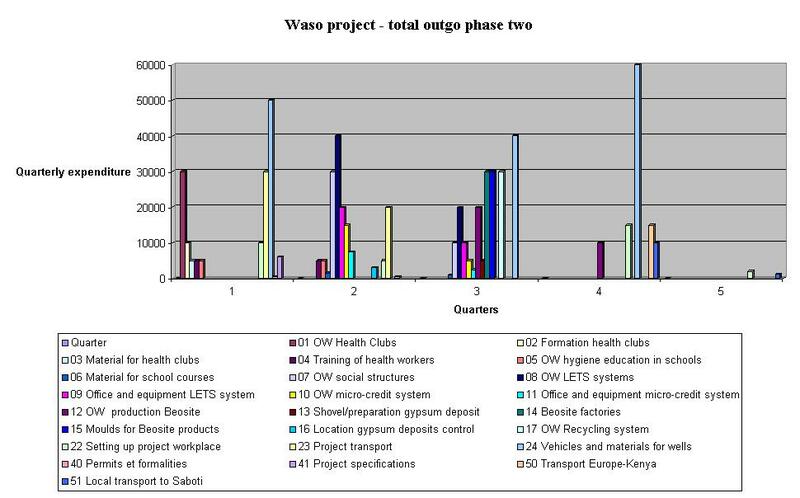 Three Moraisian workshops will probably be held (one in Waso West, one in Waso East; and one in Waso North) during which draft Health Clubs rules will be prepared and discussed with the local people so the community fully "owns" the project. The Health Clubs will be a socially acceptable method of getting people used to working together, the cornerstone for a successful project. Local Health Workers will be trained to lead Health Club discussions. Material for the Health Clubs and for hygiene education courses in schools will be adapted, preferably using local artists. Preference will be given to the use of traditional local art styles. 300 female initiative takers at the level of the future Tank Commissions. BASIC INDICATIVE COURSE FOR HEALTH CLUBS. One Moraisian workshop will be held during which Local Health Workers will be trained to lead hygiene education courses in the schools. Material for the courses in schools will be adapted, preferably using local artists. Preference will be given to the use of traditional local art styles. Three Moraisian workshops will be held, one in Waso West, one in Waso East and one in Waso North. The Tank Commissions form the basic project structure and the workshops can involve up to 1500 people. 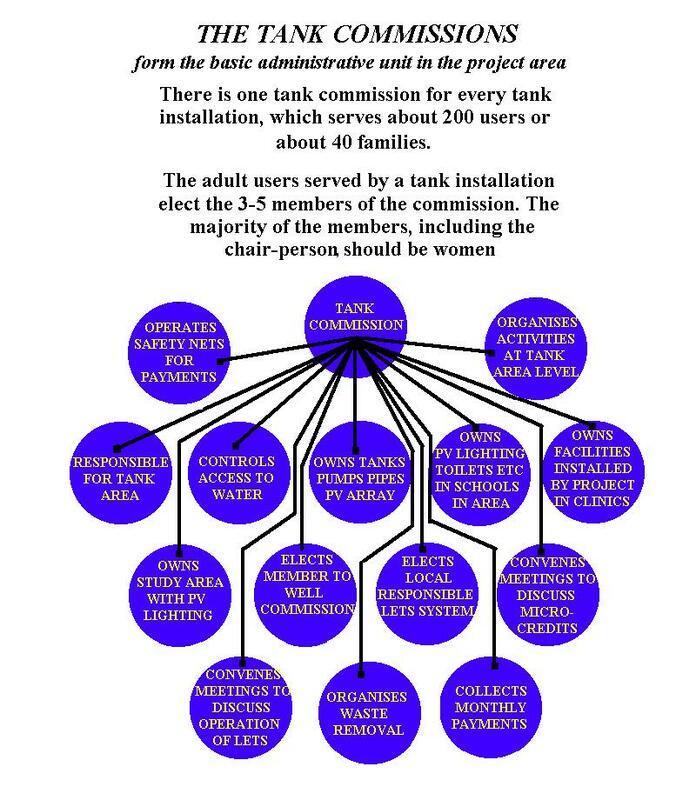 1300 (mostly female) persons interested in participating with responsibility for the management of projects structures as members of the Tank Commissions. 35% of these people might be indicated by the traditional chiefs, 65% by the local Health Clubs. Three Moraisian workshops will be held, one in Waso West, one in Waso East and one in Waso North, for each local money LETS system. 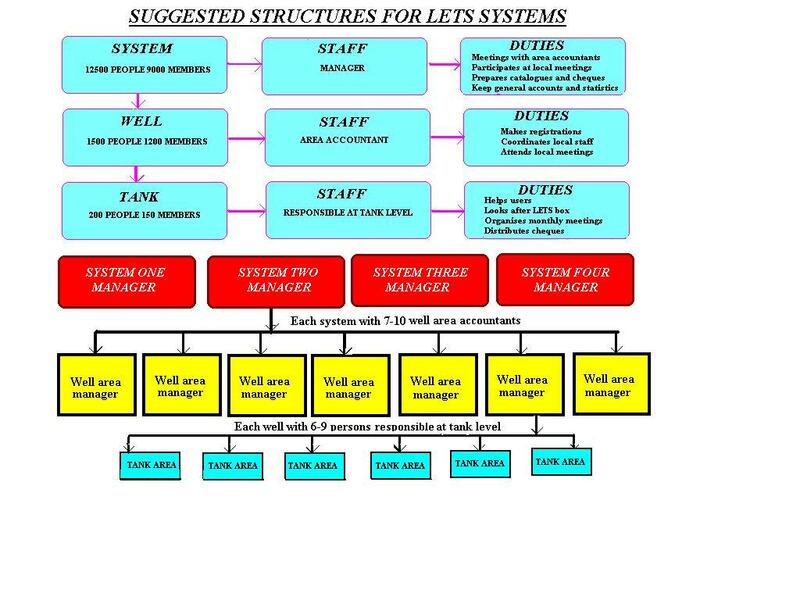 400 persons (men and women) indicated by the Tank Commissions interested in taking responsibility for the management of the LETS systems at tank commission level. 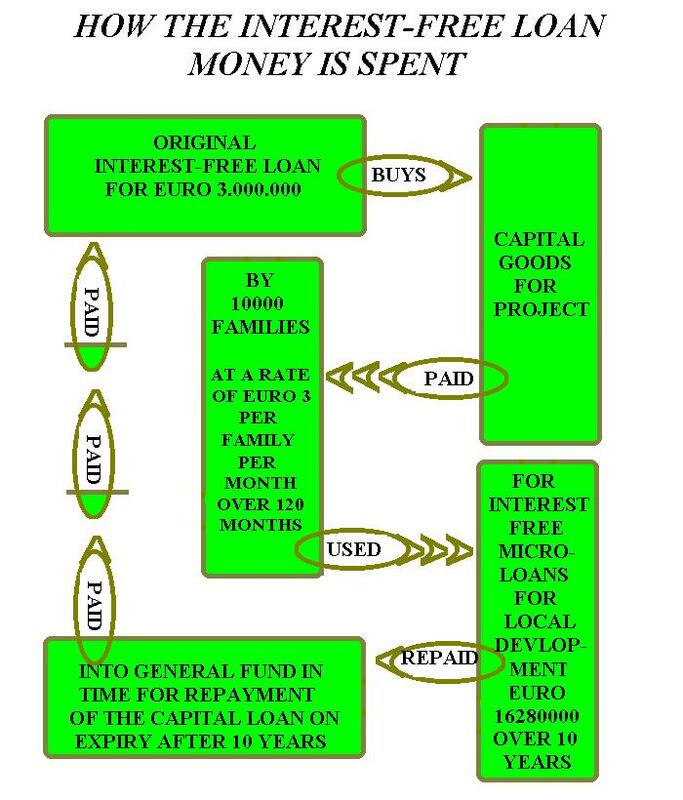 4.2.4 MICRO CREDIT SYSTEM STRUCTURES. The Waso Cooperative Local Development Bank will manage formal currency funds necessary for running the project, acting on instructions of the project coordinator given on receipt of the indications received from those responsible at tank commission level. The funds do not belong to the bank, which will intervene only in the practical management and transfer of the funds. The decisions are taken by the users' structures set up under the project. The funds formally belong to the users until the expiry of the 10 years' interest-free credit term. The interests of the financing parties are protected by their representatives nominated to the board of the ONG, who will be invited to participate in the workshop. 350 persons, indicated by the tank commissions, interested in participating with responsibility for credit arrangements at tank commission level. 4.2.5 GYPSUM COMPOSITES PRODUCTION UNITS. Three Moraisian organisational workshops will be held, one for each production unit planned. Localities to be decided in accordance with the local availability of gypsum or anhydrite or the need to import it into the project area. Two Moraisian workshops will be held, one for each LETS local money system. 150 persons (male and female)indicated by the tank commissions, interested in participating. 4.2.7 STRUCTURES FOR THE PRODUCTION OF BIO-MASS FOR STOVES. 4.2.8 STRUCTURE FOR THE RADIO STATION. The station will have two transmitters one placed in Kiia Han and one in Sere Olipi so as to limit the transmission radius. A PV operated station may be preferred to one running on "imported" electricity, as this increases the autonomy of the station and reduces long term financial leakage from the project area. The management of the station will be completely autonomous. 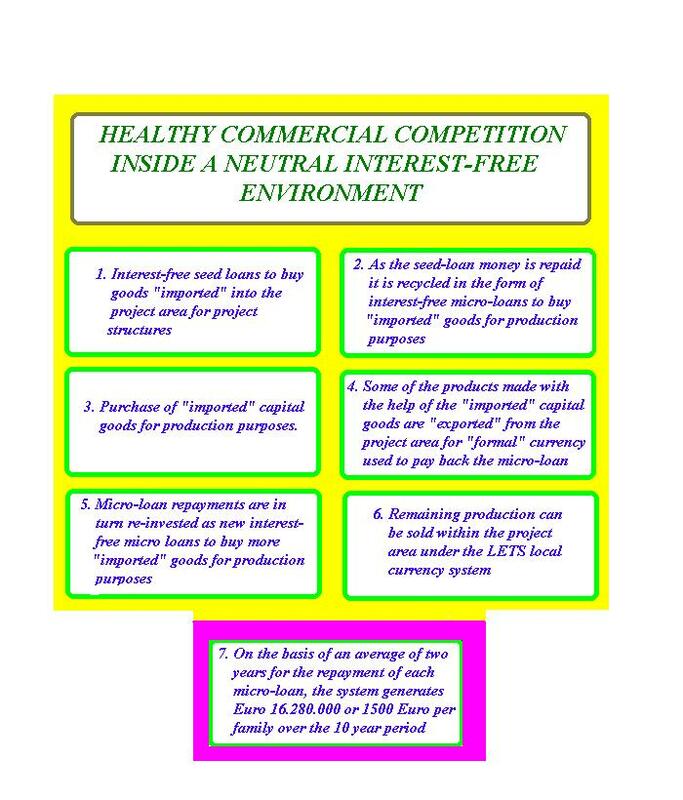 (e) Promotion of the project towards the outside. The setting up of the station is covered by a separate item in the indicative balance sheet. The workshop must decide how the station reimburse this interest-free credit. -a) Collection of a small (formal currency) contribution at household level? - c) Advertising by producers in the project area towards people living in the surrounding areas Usually just one Moraisian workshop will be held in a given project area. 20 persons indicated by the tank commissions interested in participating in the management of the station. 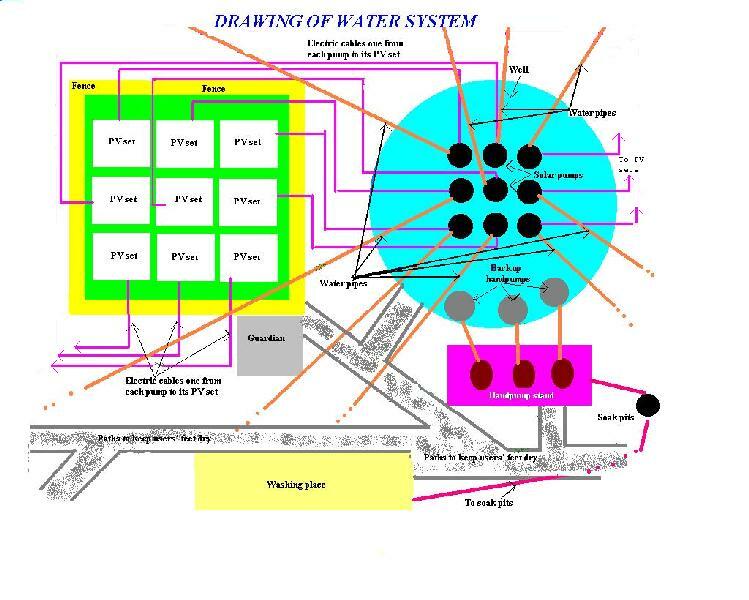 4.2.9 STRUCTURES FOR THE DRINKING WATER DISTRIBUTION SYSTEM. 1. The above net income is sufficient to finance and repay an interest free loan for Euro 3.750.000 over a period of 10 years, taking the various reserves into account. 2. Interest-free loan for Gypsum composites each factory Euro 40.000, for repayment over a period of 3-5 years is included in the above figures. 3. At the end of the ten years' period, on repayment of loan, large capital reserves will be built up for use in Micro-credits and, subsequently, for the extension and renewal of the capital goods. 4. Payments for water facilities for schools and clinics are included in the users' monthly contributions. 5. 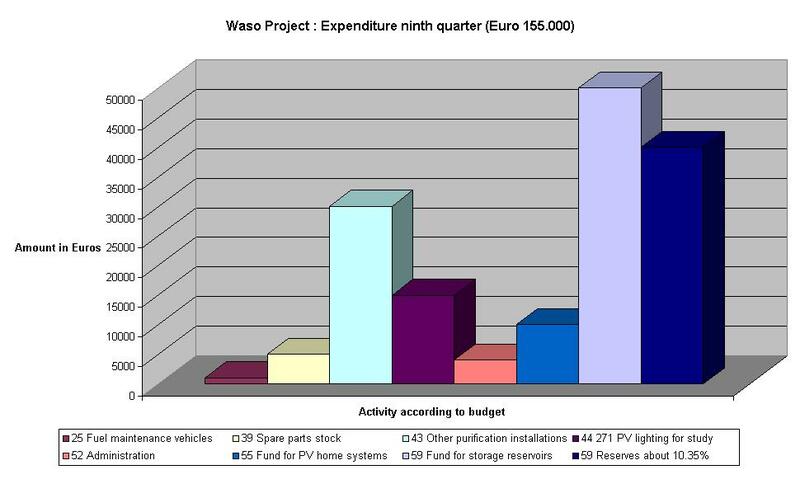 Payments and financing for eventual PV lighting and refrigeration facilities in clinics within the project area are covered in the users' contributions. Those for clinics and schools outside the project area partly serving users within the project area to be discussed. 6. Payments for PV lighting installations for study purposes will be financed by each tank commission area separately. 7. Savings on the purchasing of bio-mass for cooking and the costs of drinking water will at least partly offset the costs of the project. 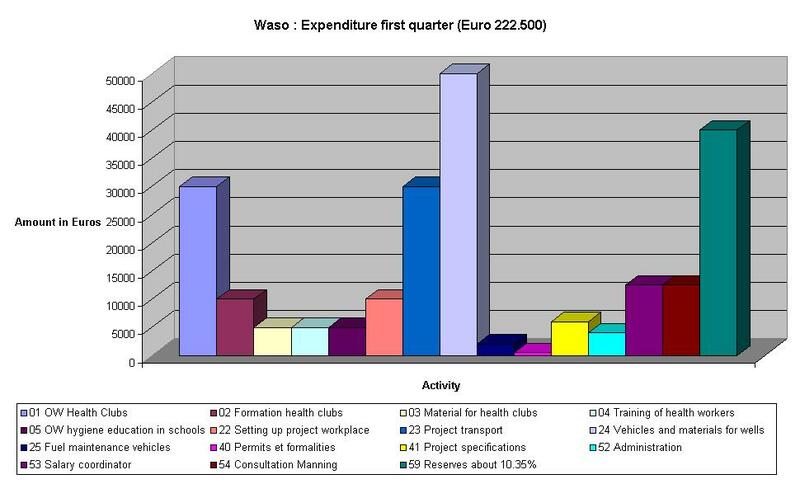 TYPICAL PROJECT EXPENDITURE BY QUARTER - budget items 01-29. 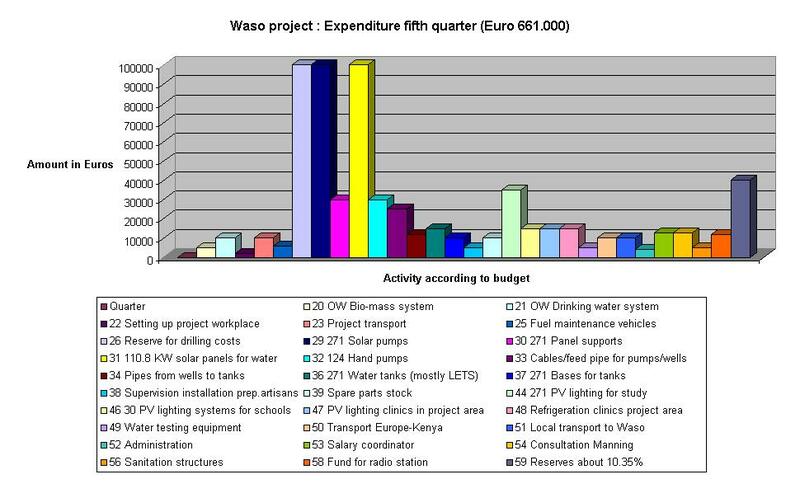 TYPICAL PROJECT EXPENDITURE BY QUARTER - budget items 30-58. Schedule 4: Solar submersible horizontal axis piston pumps. Schedule 7: Health Clubs courses. 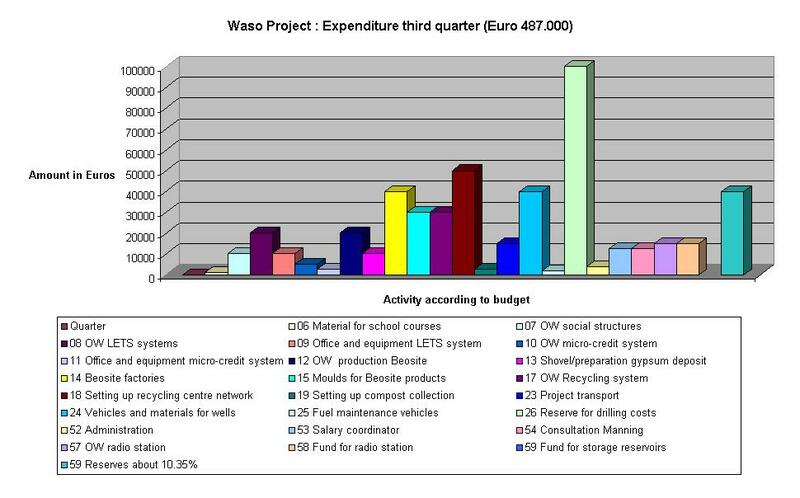 Details of the Waso project.